After reading part one (Consistent Peaking – Part One) you’ll know I’m not a believer in magical peak weeks, but I do believe in the ground work in the weeks preceding it. It’s there where the magic truly happens, and in those weeks your priority should be on getting in true contest shape before you even enter your peak week. If you’re not in contest shape a week out from your show and you’re relying on voodoo tactics (refer to part one), then you’ll most likely fall short of your true potential no matter how your peak week is set up. Based on my 30+ years of experience, I’ve never seen anyone get in true contest shape where they relied heavily on peak week to make up for what they lacked in the weeks prior. If you’re trying to score a winning touchdown by calling a Hail Mary pass and you only have one second left on the clock, your chances of winning are extremely slim. You should be in great condition ahead of time and that comes from giving yourself enough time to strip off as much body fat as possible in the most efficient manner (to ensure muscle retention). That is exactly what Thomas Davies (above) did in the 30 weeks leading up to his peak week. He stripped off 25lbs over 30 weeks with an effective and efficient approach to fat loss. Rate of fat loss is a topic for another day, but if you’re interested in learning more you can go here. I know this blog is supposed to address peak week and I promise I’ll get there, but I feel it’s extremely important to understand the value of his overall game plan that directly tied into his peak week. Our approach with macronutrients was 5 low days followed up by 2 high days (high day amounts were auto-regulated at times depending on his rate of fat loss, gym performance, recovery, fatigue levels, etc. ), with structured diet breaks after a certain number of weeks (generally 8-10 weeks, but progress dependent). Thomas did well without cardio for the first twelve weeks as his step count (8-12k) and food levels drove the deficit. However, we ended up throwing in 4 steady state cardio sessions per week (burning 400 calories per session) once fat loss slowed. As far as training, we ran a five-day split (2 on, 1 off, 3 on, 1 off), hitting body parts 2x/week, and utilized a linear progression using RPE. Of course, there were protocol adjustments made along the way and plenty of context behind them (discussion for another time), but it’s important to note the overall game plan was based on a well-structured and consistent approach. Another important aspect to note is Thomas’ terrific work ethic, his precise execution and consistency played a valuable role in his weekly progress. 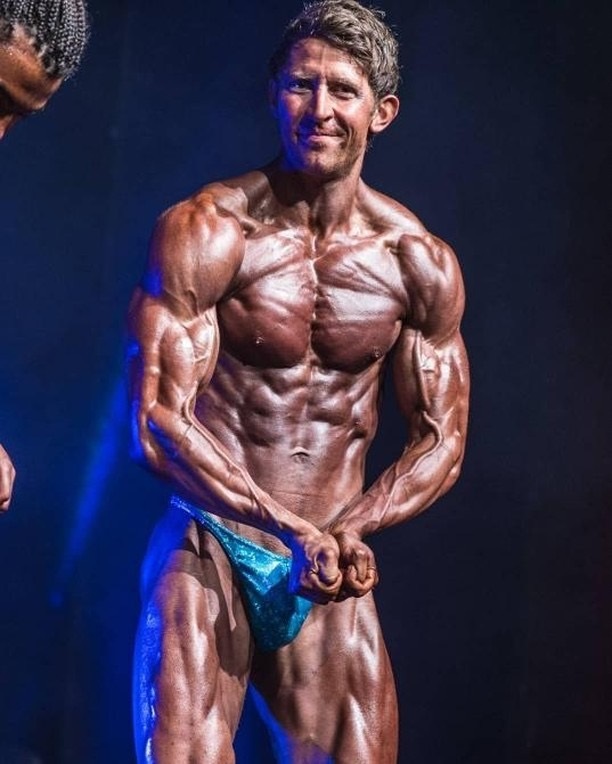 His precision and consistency over 30 weeks made it far easier for me to assess his progress and make changes, which extended all the way into peak week. 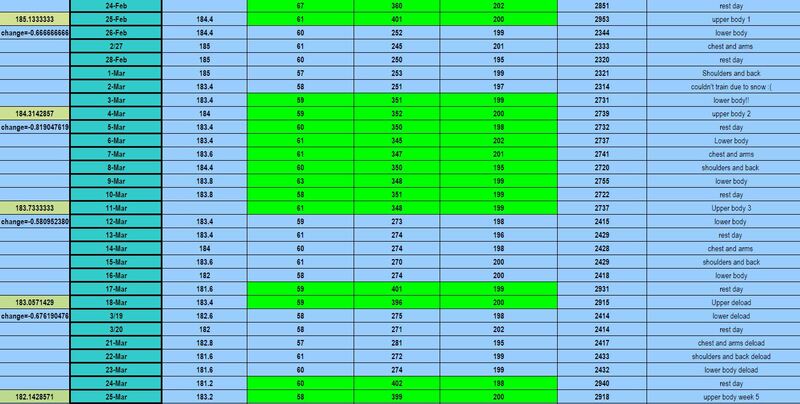 Below are some snippets of Thomas’ prep (in numbers) so you can see how valuable structure, precision, consistency, and the resulting predictability lead to better adjustments and a solid reference for future game planning. Took a diet break in the 9thweek to recharge the batteries. Down the stretch we did a little more digging with cardio. The last couple of weeks leading into peak week. 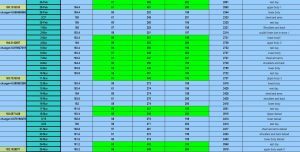 As you can tell by now, I put a lot of emphasis into precision and consistency as it leads to progress, but also like I mentioned earlier, it gives me predictability and confidence when setting up my athletes’ peak weeks. Personally, as a coach, I’m not trying to find a magic bullet or voodoo tactic, tossing that proverbial Hail Mary pass. Rather, I stay true to each athlete’s time-tested protocol that was built in the weeks prior. 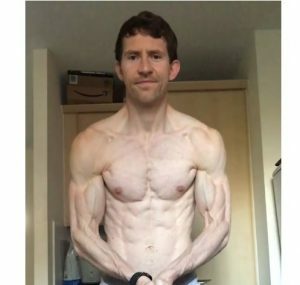 Now that I’ve hammered home how important it is to get in contest shape prior to peak week utilizing a well-structured, precise and consistent approach, let’s finally discuss Thomas’ peak week. Over the course of prep, we observed that the biggest impact any single macronutrient had on Thomas’ physique (and his performance), was his carbohydrate intake. During refeeds he appeared much fuller and tighter (more glycogen stored within the muscle that leads to more fullness/size) and he was more energetic on the Mondays afterward, so I knew I wanted to back load (higher carbs 2-3 days prior to show) leading into his show. 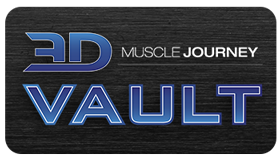 Fat (50-60g) and protein intake (200g) were for the most part constant throughout his prep, so it made perfect sense not to alter those macronutrients during his peak week. Carbohydrates were the only moving part during his prep (in regard to macros) which made it fairly simple to interpret any changes. Thomas’ response to refeeds informed how I strategically set up his carbs during peak week. Two weeks out from his show I wanted to get an even clearer picture of how Thomas responded to his refeeds, so I had him take a number of videos of his physique: 1) the morning of his first refeed day on an empty stomach, 2) the night of his first refeed an hour after all his food was consumed, 3) the morning of the second refeed day, 4) the night of his second refeed day, and then 5) a video the morning after the two refeed days. I also experimented with a higher carbs (600g; prior refeeds 400-500c) during his 2-weeks out refeeds to see how he would respond visually and to assess his digestive tolerance to the increase. I knew from weeks prior that he handled the 400-500c refeeds well, but his physique at times didn’t always look fully “topped off” (at its fullest/hardest). So, through experimentation and visual assessment in advance of his show, I got a better idea of just how much he could handle and where to strategically place his carb intake during his peak week. As a note, Thomas was already in contest shape two weeks out, so experimenting with larger refeeds didn’t impede progress. After looking at the videos, I learned he looked his “flattest” the morning of his first refeed and his “fullest” the night of his second refeed. The morning after both refeeds he looked full, but not necessarily as tight as I would have liked (slightly “spilled over”). 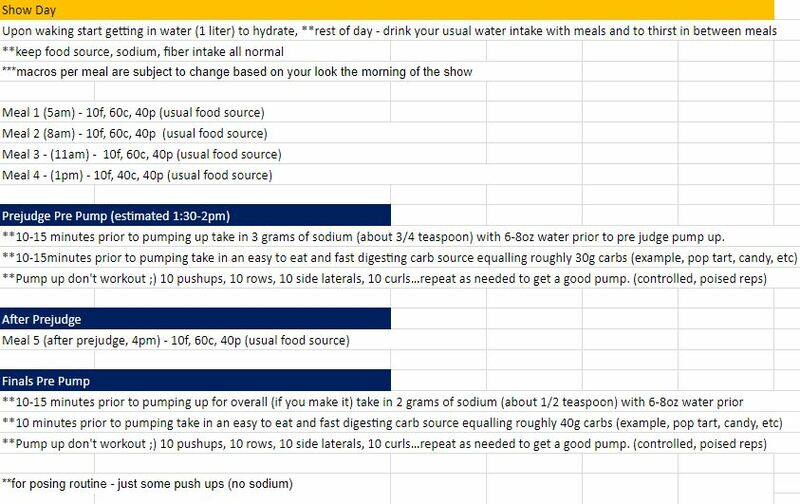 So based on the data we collected and using sound theory, I set up a slightly lower carb intake (400g) the day prior to the show in order to tighten him up and give him the look we were after. 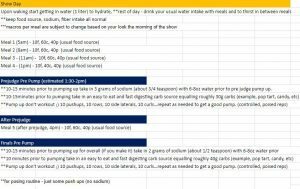 Around four weeks out from show day, I had Thomas start logging his water, sodium and fiber so I could get an idea of his average intakes. I also emphasized to him not to purposely lower or increase these intakes (as to not disrupt equilibrium, refer to Part 1 as to why), but to simply track them. 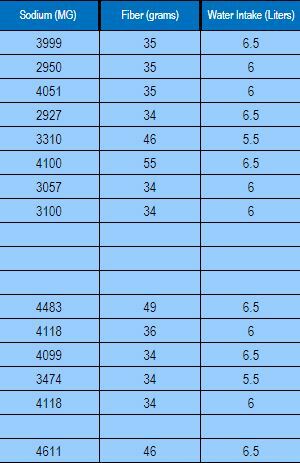 When there was large variability in his sodium, fiber, or water intake day to day (1000+ mg sodium, +/-15g fiber, +/- 2L water), I asked him to close those gaps to create a more consistent baseline, to hopefully result in more consistent look. The more consistency in his intake and his look allowed me the confidence to know that the shifts in his physique I observed were caused by my adjustments. 4 weeks out – Actual sodium, fiber and water intake. For peak week, I set his sodium intake close to his usual ranges on lower carb days and increased sodium on the higher carb days to leave room for the natural uptick in sodium that occurs from eating more. Water intake was set as his average during the lower macro days and I gave him a slight bump on his higher macro days to help process the increase in food. I really like my athletes to eat the same foods they ate throughout their prep during peak week unless there’s a certain food(s) they’ve been eating that’s causing digestion and or bloating issues. Digestion issues and bloating is not something you want to deal with during peak week and certainly not on the day of the show; thus, eliminating known foods that cause these issues is recommended. It’s also not a good idea to introduce new foods during peak week as there’s some uncertainty as to how your body might respond. It might respond well, but it’s not worth the risk in my opinion as you’ve worked too hard and for too long to risk dealing with any digestion and or bloating issues on show day. Not only do you need to consider new foods, but also ingesting too much fiber (especially insoluble fiber) as that can potentially cause digestion issues and or bloating. If this is a normal occurrence with your usual foods, then you might do better reducing your overall fiber intake and/or your insoluble fiber the day prior to the show as well as on show day. Typically this is done by swapping out complex carbs (more fibrous) for simple carbs (less fibrous such as white rice, rice cakes, etc.) which for many athletes tends to be a safer choice when it comes to digestion. With the latter, I recommend experimenting well before your peak week for the reasons I mentioned earlier in regards to digestion. For more on fiber you can check out this blog on fiber by our registered dietician, Steve Taylor. I prefer to keep training in line with what my athletes were doing leading up to peak week, with only slight modifications. 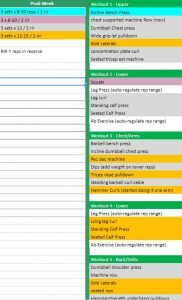 Before touching on the modifications, I want to reiterate the importance of keeping variables consistent, including training. Doing so leads to predictability and confidence when planning a peak. 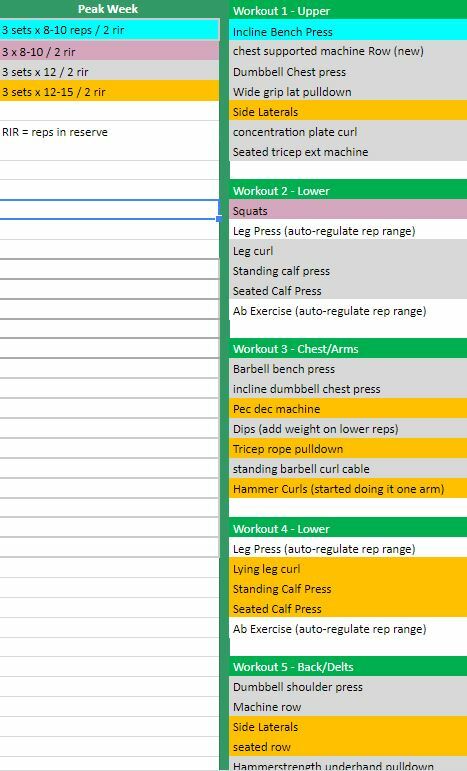 The last thing I want for my athletes is for them to experience the stress of a complete overhaul of their training during peak week (refer to part one). For Thomas, I kept in his 5 day split and simply maintained his volume, but reduced intensity (ensured all sets were completed with 2 reps in reserve) to prevent any excess fatigue and or soreness from surfacing. In a nutshell, he did enough work to maintain muscle without burning out. I scheduled his last leg session three days prior to the show and removed all forms of deadlifting to ensure he wasn’t stepping on stage with sore or fatigued legs due to the high demand of those lifts. Having sore and or fatigued legs would only make it harder for him to pose on show day and I definitely wanted him to be able pose his legs optimally. As an athlete or coach, it’s important to know ahead of time how the show will run so you can estimate when you or your athlete will be on stage. Having an estimated stage time ahead of time helps immensely with the meal planning to ensure an athlete is filled out and ready to go. Along with knowing the stage time, I really like to know my athletes’ typical meal size, so I have a good understanding of what they can handle digestively. When game planning their show day meal schedule I don’t want to cause discomfort with bloating, so having an understanding of what their typical meal schedule looks like is important. Again, maintaining consistency leads to predictability and that ensures my athlete’s stress levels are minimized. With Thomas’s show day meal schedule I needed him to get in enough food (specifically carbs) to ensure he was filled out well without spilling him over or creating any discomfort with digestion. In his case based off of his refeed data I touched on earlier, I knew we needed to get in roughly 250c pre stage. I made it a point to start his meal schedule well before stage time to ensure he was getting in four moderately sized meals that he’s accustomed to in order to allow for efficient digestion. As far as water intake, I had Thomas drink water upon waking (a liter or so) to rehydrate from the previous night’s sleep. The rest of the day I had him drinking his usual intake with meals and to thirst in between meals to avoid dehydration as that can lead to a flat appearance on stage. Getting a pump prior to taking the stage makes a significant difference in your appearance. You look bigger, harder and more vascular. With that said, it’s important to note that the goal is to get a good pump, but not at the expense of tiring yourself out. Keep in mind you have to pose onstage and to be quite frank, it’s quite demanding. So, pacing yourself while pumping up is crucial so that you have plenty of energy for posing. For more on that, you watch a video I made on the subject here. Roughly 10-15 minutes prior to pumping up, I had Thomas’ take in 3 grams of sodium and 6-8 ounces of water to acutely raise his blood pressure to aid his pump up process. Along with the sodium and water, I had him take in 30 grams of fast digesting carbs to help with the pump, but more so to provide energy for posing on stage. If he ended up being on stage in a dog fight, I wanted to make sure he had enough energy to sustain his poses during a longer competition. As far as exercises, in general, pushups (chest, delts, triceps), rows (upper back, lats), laterals (medial delts) and curls (biceps) to hit all the upper body musculature is what I recommend. Do ~10 reps for each exercise in a round robin style with control and poise until you’ve acquired a good pump. After thirty precise and consistent weeks, Thomas’ peak week “magic” truly came from the weeks prior where he got shredded, and put in consistent work, which lead to him reaching his all-time best shape.